The longer answer is: Recent studies have shown that there really are optimal posting frequencies for the different social media platforms. And the good news is, it’s probably not as often as you may have heard! That Facebook Page posting hourly, or Twitter account posting every 15 minutes? Forgetaboutit. Maybe it works for accounts with 100,000’s of followers, but it doesn’t work for the average business using social media marketing. This post has been updated for 2019 by deleting Google+ (buh-bye) and adding YouTube. 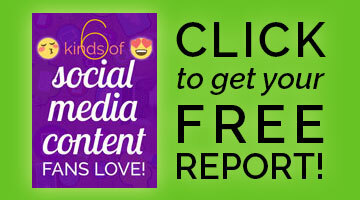 You’ll find everything summed up on a colorful infographic at the end, PLUS a free content guide to keep your social media posts engaging! 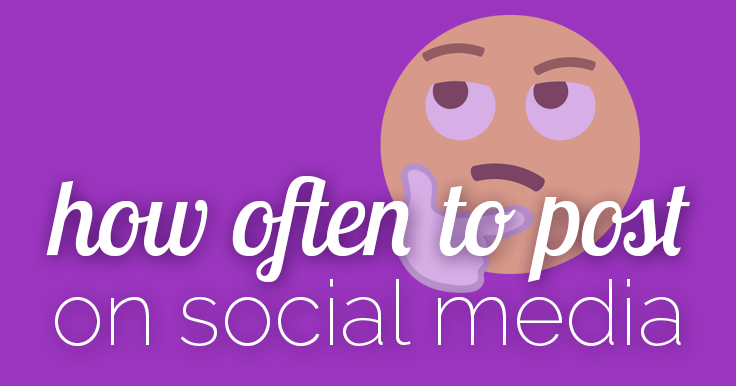 Is how often you post on social media important? If you post too infrequently, your audience will forget that you exist and you will quickly fade into the deep dark recesses of their minds. However, if you are posting too often, you will become a complete nuisance and they will dread seeing your posts overcrowding their feed. So here’s what the research says, to help you get this right. I share my own posting frequency. Don’t try to max out every platform – unless you have unlimited time or funds. Or use a magical scheduling tool, like Missinglettr, mentioned below (my secret weapon!). Disclosure: Some links below are affiliate links, which means I’ll get a small commission if you purchase. I only recommend social media management tools I use and love! Most studies agree that once per day is optimal, with a maximum of two posts per day. Hubspot found that pages under 10,000 fans experienced a 50% drop in engagement per post if they posted more than once per day. At a minimum, you should post to your Facebook Pages 3 times per week. As far as when to post to Facebook, I keep seeing studies that tout early afternoon. That’s never worked for me. It may be that more people are online and sharing then, but I think that just means I’m lost in the crowd. I find it best to post before 6:30am Pacific, or after 8:30pm. I post 2–3 times per week. When your audience is online will determine when you should post. Be sure to check your Facebook Insights. You can schedule your posts in advance right on your Facebook Page. READ: How to Schecule Facebook posts FREE! For engaging, viral content scheduled in a snap, you should try PromoRepublic. You can edit and add your branding to their clever, pre-made content – or just post it as-is! PromoRepublic also schedules to Twitter, Instagram, and LinkedIn, but the content is most needed on a platform like Facebook, where users are looking to connect and have fun. An easy, automated option for bloggers is Missingletter. Read more below. This seems to be a big controversy these days! I was recently taken to task for “only” posting about 10 times a day on Twitter. The top accounts are posting 100 times a day, I was told. Well, that’s just not necessary. But the studies I found did vary wildly – anywhere from once per day to 51 times a day! More helpful is a general consensus of 3 to 30 times a day. Tweets do have an incredibly short shelf life, so it’s important to spread your tweets through the day. If you blog, you’ll adore using Missinglettr to automatically create visual content and schedule your blog posts. Read more about this social media tool for bloggers. The recommended minimum is 3 Pins per day, with a maximum of 30 Pins per day. Posting more than 30 Pins per day does not show any additional benefits. Pinning often is easy with Tailwind. You tell it how many times you want to pin per day, and it sets up recommended time slots for you. Save a Pin to Tailwind, and it falls into the next slot (or you can customize the times, if you wish). I started with about 5 Pins per day and have worked my way up to about 12 scheduled Pins, plus a few “live” Pins here and there. Posting this often has definitely done amazing things to grow my followers – I more than tripled my account in 2016, to 14K followers. And despite follower growth becoming increasingly difficult for most Pinners, I added another 5,000 followers in 2017. Now I’m a huge fan of automating virtually everything Pinterest with Tailwind SmartLoop. It’s generally recommended to post at least once per day, and no more than 3 times per day, on Instagram. I’ve found similar times of day to Facebook effective: my Iconosquare stats showed that 8pm was my best time, closely followed by 6am. Remember I’m on the West coast, so that’d be 9am and 11pm Eastern time. I don’t use any schedulers here, but you can read about approved partners for Instagram scheduling. These can auto-post for you safely! This one’s easy. At least twice a week, and no more than once each business day, which is optimal. Post in the mornings. I share my new or updated blog posts here, and I was only posting once or twice a week, but now I use Missinglettr. This recirculates my blog posts and keeps them in front of my connections – because some may have missed them (or not had time to read) previously. Once again, consistency is key. Create a specific YouTube posting schedule. Post your upload schedule on your YouTube account. Don’t overcommit! Creating YouTube videos takes time. Bank YouTube videos so you have them ready to upload on your schedule. The best times to upload to YouTube are Thursdays and Fridays between 12 and 3pm in the time zone of the majority of your subscribers. Monday and Tuesday are the worst days to upload to YouTube. Hat tip to CoSchedule, Buffer, and Neil Patel for data. Here are more considerations from Amy Landino! I included my own thoughts and frequencies, and suggested scheduling tools. Tailwind for Pinterest and Instagram. More options for Instagram scheduling can be found here. PromoRepublic if you need fast, viral content for Facebook. To automate blog post sharing, Missinglettr. Choose your pace and stick to it, so your followers know what to expect. Consistency is key to attracting and retaining followers! Of course, high quality content is a must. Posting more does not mean your content will be seen more! Different social networks’ algorithms work differently, but engagement and relevance is key to all! So it’s not just how often you post, but posting quality content your audience craves. Now that you know how often – what should you post? Don’t take on more platforms than you can handle. Create and schedule content in bulk, to save time. Keep fresh ideas flowing with the Social Media Content Planner! Does this help you with how often to post on social media? Let me know! Thanks for the data and infographic! Tell me, do these posting frequencies refer to your own content or total content including curated content? For example, one post a day on Facebook seems low if you were to post a mix of your own content and other people’s content. Re: “Hubspot found that pages under 10,000 fans experienced a 50% drop in engagement per post if they posted more than once per day.” The study was on total posts per day. CoSchedule recommends alternating your own content and others’. But if posting more frequently works for you, keep doing it! Your own results are more important than averages from a bunch of pages. Really amazing blog with very much helpful information, thank you very much for writing this great blog. Only once a day on FB? That seems really low and against the advice of most people I have read. Not sure what to do with that. I guess I’ll look up hubspot and see where they are getting that #. I’m hearing it more and more. Jenn Herrmann was suggesting 5-7x a week about a year ago. And I recently heard a page with 100K fans say their best results are when they post only 3x a week! I think you have to test and see what works best for your audience. Love it! Go all in on content marketing, it is how people find you. Especially through social media because that is where all the attention is. Awesome Information. keep doing the nice work. I love the big simple chart! It’s so true if people over post on my instagram and facebook I stop following them. I clogs my feed. I like to see what other people are up to. Also if people do too many selfies I don’t follow. Do you know if creating a Facebook event counts as a page post? I have a lot of events and a ton of content, so I consistently struggle to keep below two per day. If it posts to your page, then I’d say yes. but if your strategy is working, don’t worry about it. Any account that posts more than five times a day to any of my social media accounts will be DELETED. Deservedly so. And a business account will be given far less leeway. 2 or 3 times a week, MAX. I think you’re saying you won’t follow a business account that posts more than 2-3 times a week. Which is fine, but I certainly wouldn’t recommend a business post that infrequently. 90+% of posts won’t be seen by any specific follower, so businesses need to post more than twice a week (depending on platform). Another great infographic Louise – So many ask this question not only on social but email marketing too. I have been going by what Buffer and Hubspot blogged about this, but Buffer never updated it – I asked on Twitter, but they never did. Your input here is helpful. I’ll share with my social network and use your infographic on our website (we’re updating right now). Nice post! It sums it nicely and I like how it shows both low and high end for posting on these various platforms. Hi, Louise. I find this so useful and I refer back to it often! I have a question about Pinterest. Is the suggested 11 pins per day the number for pinning your own pins or others’ pins? Sorry if this question seems really obvious. I’m new to Pinterest! Hi Mayo. That would be total number of pins from yours and other websites. Really informative post ! Facebook’s new algorithm update reduces the organic reach, when we post too often, we can see lot’s of post not reach as we expect. This post is amazing. Thank you so much for the great and helpful tips. I disagree with LinkedIn. 1/week is plenty. Everything else in this article is awesome, though! I just don’t want to see a ton of personal stuff on LinkedIn and think it should be kept professional and only share what is actually important. Everyone’s entitled to their opinion. This post isn’t an opinion piece though, it’s the results of 10 different studies on what actually gets optimal engagement. Feel free to do what works for you.